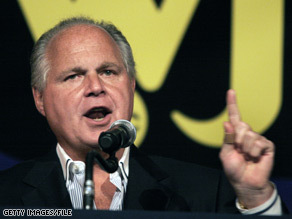 Limbaugh is going after Sonia Sotomayor. (CNN) - While Republicans on Capitol Hill appear to be adopting a wait-and-see approach with Supreme Court nominee Sonia Sotomayor, conservative talk radio host Rush Limbaugh is taking direct aim at President Obama's choice for the high court. Calling Sotomayor a "racist" and a "hack" on his radio show Tuesday, Limbaugh took particular issue with a 2001 speech at Berkeley during which she stated a "wise Latina woman with the richness of her experience would more often than not reach a better conclusion than a white male who hasn't lived that life." "Here you have a racist – you might want to soften that, and you might want to say a reverse racist," Limbaugh said of that comment. "And the [liberals] of course say that minorities cannot be racists because they don't have the power to implement their racism," he continued. "Well, those days are gone because reverse racists certainly do have the power to implement their power. Obama is the greatest living example of a reverse racist, and now he's appointed one." "She's not the brain that they're portraying her to be. She's not a constitutional jurist," Limbaugh also said, referencing a New Republic article last month in which Jeffrey Rosen, the magazines legal affairs editor, wrote that "her opinions, although competent, are viewed by former prosecutors as not especially clean or tight, and sometimes miss the forest for the trees." 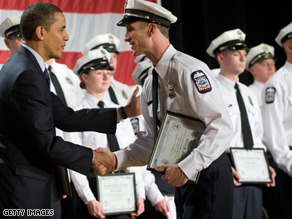 President Obama attended the graduation of 25 police recruits in Columbus, Ohio, in March, touting it as a victory for the federal stimulus package. (CNN)- It was a success story the White House was eager to highlight: earlier this year, President Obama attended the graduation of 25 police recruits in Columbus, Ohio, touting it as a victory for the federal stimulus package. Without the money, the officers never would have hit the streets. They were to be laid off before their first day of patrol - victims of city budget cuts - until the stimulus money saved the class. But the White House said the $1.2 million grant only guaranteed their jobs until the end of the year. And facing a growing deficit and a fight to pass an income tax hike, Columbus Police Tuesday announced massive budget cuts that could mean hundreds of layoffs. Among those who could lose their jobs if voters reject the increase: the 25 new officers who shook the president's hand. Malesko v. Correctional Services Corp. (2000), 299 F.3d 374: Sotomayor, writing for the court in 2000, supported the right of an individual to sue a private corporation working on behalf of the federal government for alleged violations of that individual's constitutional rights. Reversing a lower court decision, Sotomayor found that an existing law, known as "Bivens" - which allows suits against individuals working for the federal government for constitutional rights violations - could be applied to the case of a former prisoner seeking to sue the private company operating the federal halfway house facility in which he resided. The Supreme Court reversed Sotomayor's ruling in a 5-4 decision, saying that the Bivens law could not be expanded to cover private entities working on behalf of the federal government. Justices Stevens, Souter, Ginsburg, and Breyer dissented, siding with Sotomayor's original ruling. WASHINGTON (CNN) - The head of the Republican Party wants his forces to watch their steps when it comes to Supreme Court hopeful Sonia Sotomayor. Republican National Committee Chairman Michael Steele told CNN Radio Tuesday the party that he hopes will include more Hispanics must be cautious in how it scrutinizes a groundbreaking Latina judge. "You want to be careful," he said when asked about juggling Hispanic outreach with potential opposition to Sotomayor, "You don't want to be perceived as a bully." Indeed, Steele was mild in his initial jabs, calling Sotomayor an "interesting pick" with "overwhelming political overtones to it." 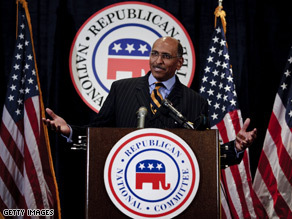 The RNC chairman listed classic conservative question marks. "We do have some reservations and concerns about her views on the second amendment, her views on abortion, her views on property rights," he said. Empire Healthchoice Assurance, Inc. vs. McVeigh (2005), 396 F.3d 136: In 2005, Sotomayor ruled against a health insurance company that sued the estate of a deceased federal employee who received $157,000 in insurance benefits as the result of an injury. The wife of the federal employee had won $3.2 million in a separate lawsuit from those whom she claimed caused her husband's injuries. The health insurance company sued for reimbursement of the benefits paid to the federal employee, saying that a provision in the federal insurance plan requires paid benefits to be reimbursed when the beneficiary is compensated for an injury by a third party. The Supreme Court upheld Sotomayor's ruling in a 5-4 opinion. Justices Breyer, Kennedy, Souter, and Alito dissented. President Obama will be in Las Vegas Tuesday to headline a fundraising event for Harry Reid. 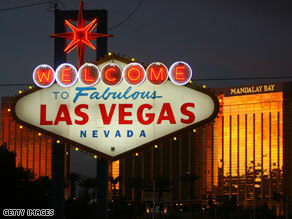 (CNN) - President Obama is set for a night out in Las Vegas Tuesday, but his latest foray to the city of lights is entirely business related. The president is slated to headline a fundraising event at Caesar's Palace for Senate Majority Leader Harry Reid, the Nevada Democrat whose approval ratings back home have sunk below 40 percent as his re-election campaign gears up. The star-studded event, set to raise at least $1 million for Reid's campaign coffers, will take place in Caesar's Coliseum - the 4,000 seat auditorium where singer Bette Midler regularly performs. A Reid spokesman tells CNN that Midler is among the entertainers on hand for the evening, as well as Vegas performer Clint Holmes, comedienne Rita Rudner, and singers Sheryl Crow and Rachel Yamagata. The fundraiser, during which Reid and Obama will speak, couldn't come at a better time for the Senate's top Democrat, who is considered among the most vulnerable in the chamber despite the fact Republicans are still scrambling to find a serious opponent to challenge him. Despite the lack of official opposition, a Mason-Dixon survey released earlier this month suggests only about a third of Nevada's voters would vote to re-elect Reid to a fifth Senate term, while 45 percent said they would definitely vote for another candidate. WASHINGTON (CNN) - Former GOP Rep. Pat Toomey, who is challenging Democratic Sen. Arlen Specter for his Senate seat in 2010, came to Judge Sonia Sotomayor's defense on Tuesday, saying the Supreme Court nominee deserves a fair chance. Toomey, a conservative, said he believed that Democrats had a "knee-jerk opposition" to Chief Justice Roberts and Justice Alito during their confirmation hearings, but that Republicans shouldn't oppose Sotomayor's nomination simply based on partisanship. "Just as it was wrong for liberal Democrats to adopt a knee-jerk opposition to Chief Justice Roberts and Justice Alito, it would be equally wrong for Republicans to oppose Judge Sotomayor on a partisan basis," Toomey said in a statement. "Judge Sotomayor deserves a fair hearing. If that hearing proves her to be of sound judicial temperament with the requisite knowledge of and respect for the Constitution, then she should be confirmed." Toomey said over the past two decades, the process of confirming Supreme Court justices has become a "political football," and criticized Specter for his role during that era. "Arlen Specter has played those political games more aggressively than most, arguing against Judge Bork and for Justice Thomas, depending on Specter's calculation of his own political needs," Toomey said. "That approach is bad for our country." WASHINGTON (CNN) – Liberal political activists will descend on the nation's capital next week to plot strategy on issues ranging from healthcare to energy and the nomination of Judge Sonia Sotomayor to the Supreme Court. In previous years the conference was titled "Take Back America," but with President Obama now in the White House it has been renamed "America's Future Now." Obama addressed the conference in 2006 and 2007, and has been invited to appear once again. So far, the president hasn't RSVP'd - but the 2,000 activists who have will be rubbing elbows with the likes of Jared Bernstein, Vice President Biden's economic advisor; former Democratic National Committee Chairman Howard Dean; and Mitch Stewart, who directs Organizing for America, Obama's political arm at the DNC.